The Sharpest Shadows at ANY Distance! Announcement Now offering low-cost DIY kits! No tools required and in less than 1 hour, you'll have a beautiful new shadow lamp. As always, we promise to have the best-in-class, highest quality, sharpest shadows! We're in the process of re-branding to our new moniker, 'Vibe Motif'. As we grow, this new brand will represent our desire to capture our concepts and mission. Follow us on instagram for even more awesome design solutions @vibemotif! Now offering low-cost DIY kits! No tools required and in less than 1 hour, you'll have a beautiful new shadow lamp. 8" Waves Shadow Lamp -Projects Crisp Shadows 20 ft! Nod to Anila Mandala Shadow Lamp - Projects Crisp Shadows 20 ft! 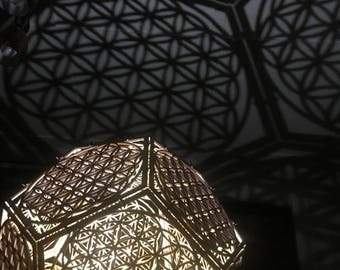 Floral Dodecahedron Shadow Lamp -Projects Crisp Shadows 20 ft! Chaucake Designs Flower Mandala -Projects Crisp Shadows 20 ft! Constellation Shadow Lamp - Cube -Projects Crisp Shadows 20 ft! Waves Shadow Lamp -Projects Crisp Shadows 20 ft! Lamp was exactly as described. It was a Christmas gift and he loves it!! Bought it as a Christmas gift for my boyfriend. It's very easy to assemble. I didn't really need the instructions to put it together. And it creates great shadows on the walls. Now I can sleep under the stars with my boyfriend without having to be out in the heat of the summer and mosquitoes. Love the lamp, was easy to put together, thanks! Turning any room into a stunning garden sanctuary. Also available in a cubic shape! New pattern alert! This wave pattern is now available for order. Stay tuned for more pictures!